Wednesday, May 19th, 2004 from 6 to 8 p.m.
Theresa Belpulsi (DC Convention and Tourism Corp.) and Tom Philipose (Guild of Professional Tour Guides) were the moderators for this workshop. 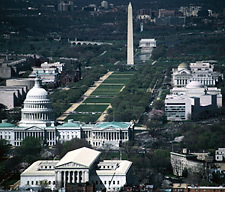 Washington, D.C. is the destination of approximately 17 million visitors each year. The primary activity of these visitors is visiting historic places and museums. Approximately 6 million out-of-town visitors will come to the Mall. To this total must be added the tens of thousands local residents who visit the Mall numerous times during the year for education, celebration, recreation, or protest. How best to educate international visitors about our history. The discussion is organized here into seven topical areas. The Mall itself, the open space, lacks development as a user-friendly place. The National Park Service doesnt plan for ways of capturing visitor interest about the Mall, but rather concentrates on interpreting memorials and also on recreation. The east end of the Mall lacks interpretation by the Smithsonian and the Architect of the Capitol. There seems to be little coordinating among the various government agencies about how to plan for public use and enliven the Mall space between the museums. The open spaces are not developed with adequate restrooms, weather shelters, shady arbors, or interesting places to eat. The Mall is seen as being too formal. A better balance between visitor amenities and flexible wide-open space for important mega events needs to be developed. Security concerns are restricting the use of visitor facilities located within each of the museums. A system of small kiosks needs to be developed to provide the missing visitor information, restrooms, weather shelters, perhaps security personnel, and food service. These might be multi-use facilities. They could be spread out throughout the open spaces. Small kiosks would provide better service and be less obtrusive. They might operate seasonally. Who would develop and operate such structures? Who would pay for the pageants, mimes, or evening activities which would add life and interest to the Mall? Is this something that a Conservancy could undertake? It will take strong programs such as these to humanize the Mall, and to enrich its landscape features. Security seems to be here to stay. Long waiting lines at museums call for the development of educational and amusement activities for those periods of waiting. This is in the tradition of Worlds Fairs. Another device might be to issue timed entrance tickets for major attractions. This would need a central control point, perhaps a central visitors center, that connects to smaller satellite facilities situated at strategic locations throughout the Mall. A greater degree of central planning and control is warranted in order to lessen the negative features of long security lines. We need to be careful that security doesnt become a reflection of collective fear, or a lack of nerve. The need for increased central management is required to help the Mall serve the general public more effectively. A private organization may be the most effective means of achieving this goal since it would not be encumbered by a past history of involvement with the Mall. The NPS has recently formed a partnership with a new organization known as the Trust for the National Mall. This organization is chartered to raise funds for a variety of major maintenance projects. However this organization was never intended to undertake planning and/or management functions. There are two other functional areas for which new policy initiatives are needed: How to properly acknowledge sponsorship, particularly involving large gifts, and how to control advertising. These are both issues that a single entity, such as a Conservancy, could address. Visitor orientation is intended to make visits to the Mall more educational and inspirational. The Workshop addressed this issue with a number of suggestions. A new series of printed guidebooks is needed- highly flexible, available in several foreign languages, and prioritized for a variety of visit lengths: half day, whole day, several days, perhaps with options for special interests such as design, social history, human interest (pivotal personalities), and suitable for different age groups. These probably would be sold, or coupled with a hotel reservation etc. Who would undertake the task of designing and publishing these? A Conservancy could take on this project. But printed guidebooks remain static, and the Mall is an ever-changing environment. How can daily or weekly changes in the Mall, its programs and sites be best transmitted to visitors? Central Park, New York, uses signboards at the entrances. The Mall, however, is a porous environment with no discrete entrances. A suggestion was made that a daily feature in the Washington Post or on the WEB, or a dial-up answering machine (with program options) might be utilized to provide visitors with up-to-date information. New wireless technologies could be effective means of reaching visitors. Another category of printed material is a series of lesson plans for use by teachers, chaperons and guides before bringing a group to the Mall. This material should focus on what it is that a visit to the Mall might produce in the minds and memories of visitors. More information is needed about what visitors are interested in as well as what they got out of a Mall visit. Perhaps university students might undertake such surveys as a class project. In the past, NPS has taken the position that sponsorship -- let alone advertising -- on printed material to be handed out on the Mall, is forbidden. Perhaps this policy could be reviewed with the objective of making more material readily available to visitors. The Downtown BID (Business Improvement District) has purchased 27 buses to start operating, at five-minute intervals, on three routes which traverse the Mall. These routes connect the Mall to the Convention Center, Downtown, and to the SW Waterfront area. They do not provide interpretive information, and thus do not compete with the Tourmobile which circles the Mall. Area. The fare for riding the Circulator will be 50-75 cents (as opposed to $15-$20 for a day-long Tourmobile pass). More routes will follow. Providing literature about transportation choices is a task a Conservancy could take on. The need for a single coordinating organization to take responsibility for the planning and operations on Mall was mentioned on several occasions during the Workshop. In particular public involvement through a well-organized and financed organization was seen as the appropriate solution to many current problems. American history is a frequent subject in secondary and higher education classes, but one properly interpreted visit to the National Mall could be worth, or reinforce, a years worth of "book learning." The majesty of the Malls concept of our democracy, as can be readily observed on the Mall, coupled with well-placed visits to museums, memorials and monuments offers an opportunity for a rich learning experience. But the key is the quality of the interpretation. An untutored tourist can walk through a forest without sensing the complex ecology that lies all around. An untutored trip through the Mall, likewise, can leave a visitor unimpressed, and perhaps frustrated rather than excited and inspired. So we need strategies designed to open the eyes and minds of even the most casual visitor. While trips may last from a half to several days, the most important lesson to be learned is that the Mall is our nations primary, set-aside place for experiencing our democracy, for meeting, learning, celebrating and protesting. One can experience these things without waiting in a single security line at a museum. It is critically important that we find the means to enrich this out-of-doors visitor experience and to provide the learning tools we will need.